Elsa Brändström (1888–1948) is famous for her work to improve the conditions for Central Powers prisoners of war, who endured extremely harsh treatment while in Russian prison camps in Siberia during the First World War. Elsa was born in St. Petersburg, where her father Edvard Brändström was serving as a military attaché. When she was three the family returned to Sweden, as her father was given the command of the Första Livgrenadjär regiment in Linköping, where she was schooled until she entered a teacher training college at Stockholm in 1906. In that same year, Elsa’s father (now a general) was returned to St. Petersburg as the Swedish envoy. In 1908, after completing her course, she rejoined the family and became a member of the Swedish Society of St. Petersburg, of which her father was honorary president. During 1913 and 1914, after her mother died, she served as the hostess for the Swedish Embassy. 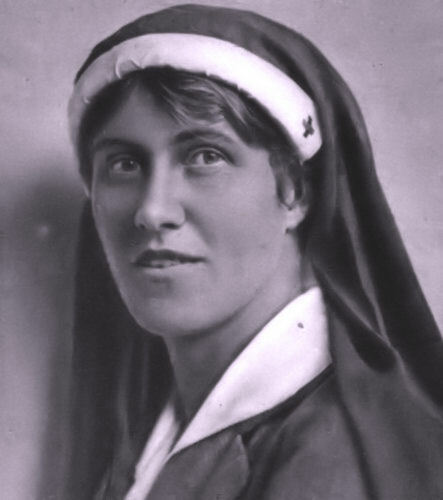 When war broke out in 1914, Elsa and her Swedish friend Ethel von Heidenstam (1881–1977) (who had also been born in St. Petersburg) signed up for a course in military nursing, while also serving at a military hospital which was funded by donations that Elsa had raised through the Swedish delegation. When the so-called exchange of invalids between the warring parties was organized, with Sweden as the intermediary, she was one of the Red Cross nurses who participated in transporting the wounded. In 1915 Elsa was asked by the Swedish Red Cross to provide relief work in the large prisoner camps in Siberia and to inspect the camps as a representative of neutral Sweden and Denmark. She also traveled across Siberia delivering donated necessities to prisoners of war. Conditions in the Siberian camps were extremely bad. There was a dearth of winter clothes, blankets and mattresses, sanitary provisions were poor, and a lack of medicines and basic medical supplies led to repeated outbreaks of diseases, in particular typhus. Of the nearly 2,000,000 Central Powers prisoners of war in Russian camps during the First World War an estimated 700,000 died. Accounts of Elsa’s work in Siberia emphasize her effectiveness and initiative. She is considered to have saved tens of thousands of lives with very limited resources by organizing and streamlining medical care in the various camps she visited. The Stretensk camp in Siberia, which she visited in 1915, became the prototype for her approach. By separating the sick prisoners from the healthy ones, arranging hospital sections, and implementing sanitary water systems, she brought an end to the ongoing typhoid epidemics, which would otherwise have led to far higher mortality figures. Following the peace of Brest-Litovsk in March 1918, due to the civil war the situation worsened for the prisoners left in Russia. 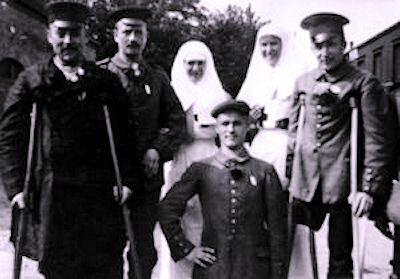 Czech prisoners who had been recruited by the Russians into the Czech Legion to fight for the independence of their homeland ranged around the country, often killing Hungarians and Austrians whenever they came across them, even some who were Red Cross personnel. In 1918 Elsa was detained in Omsk under suspicion of being a Bolshevik spy. She was interned and threatened with execution but eventually released, as she had contracted typhoid. 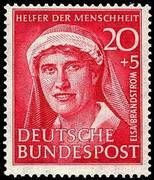 After her unexpected recovery she returned to Sweden in 1920, then moved to Germany in 1922. Elsa continued to support the cause of the German and Austrian prisoners of war long after the end of hostilities, founding the Siberian Prisoner of War Relief Association. Her activities were partly funded by the publication of her memoirs of the time she spent in the POW camps and by fees from a lecture tour through the U.S., as well as donations that she solicited. She purchased the Marienborn health resort in Saxony and converted it into a work and retirement home for former prisoners of war. Fulfilling a sacred promise that she made to dying POWs, she also established a children’s home at Neusorge Castle near Mittweida for those whose fathers had died in Siberia. In the autumn of 1929 Elsa, at age 41, married the German academic Robert Ulich and they settled in Dresden, where, in 1932, their daughter Brita was born. Due to her fame arising from her work with the prisoners of war, Elsa’s support was courted by the new German chancellor Adolf Hitler, but she declined. Elsa and her husband disapproved of the manner of the Nazi takeover of power, and in 1934 the family moved to the U.S., where Robert had secured a lectureship at Harvard and Elsa worked to obtain residency permits for hundreds who were fleeing from Nazi Germany and later from occupied Denmark and Norway as well. With regard to her humanitarian contributions, Elsa has been likened to her fellow Swede Raoul Wallenberg. Several biographies and other accounts mention that she was considered for the Nobel Peace Prize five times in the 1920s. Elsa was stubborn and psychologically resilient, an effective and perceptive organizer with a strong sense of social justice and strong leadership skills. It is clear that she left a strong impression on her environment, and she also had a remarkable talent for dealing with the media. Several short pamphlets and exhibitions, largely based on her own accounts and the 1932 biography written by her school friend and fellow Red Cross nurse Elsa Björkman-Goldschmidt (1888–1982), testify to the interest she generated among her contemporaries in Sweden. After the end of the Second World War Elsa was afflicted with breast cancer, and she died on 4 March 1948 in Cambridge, Massachusetts. At her funeral in Sweden she was described by the Stockholm bishop Manfred Björkquist as “the fighting Valkyrie of mercy.” Coincidentally, the young Elsa once appeared dressed as a Valkyrie when laying a laurel wreath at the bust of the warrior king Gustav II Adolf at the Swedish Society of St. Petersburg’s annual celebration on 6 November 1910. Another account, referred to in one of her biographies, is more evocative in its duality—she accepted her tasks with the assured bravery of a soldier and the triumphant certainty of a ball queen. In addition to a range of monuments dedicated to Elsa, several schools in Germany have been named after her, and there are over 130 streets and roads named for her in Germany, Austria, and Sweden. Thank you for a fascinating post. Would love to know if there is an English (or French) language biography of her. What a life. Thank you for the writeup, James.